Bryozoans (Phylum Bryozoa) are colonial, sessile animals that are usually encased in a protective covering with an opening for the animal's protruding tentacles. Each individual is very small and measures only several millimeters in length. They are usually found in marine environments, although some species are found in fresh water. Standard methods of introduction include ship fouling or transportation in ballast water of ocean-going vessels. 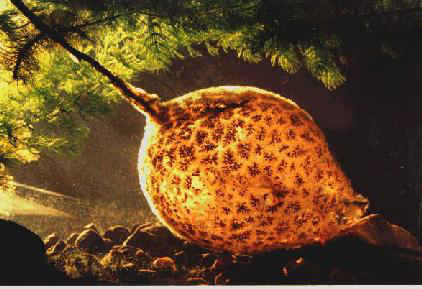 Potential impacts include competition with native species for suitable substrate and effects on organisms to which they attach. An example of a nonindigenous bryozoan is the lacy-crust bryozoan, Membranipora membranacea (pic 139k), which has been introduced to the coast of New England. Within three years of its introduction it had become the dominant kelp epiphyte off the coasts of New Hampshire and Maine. Kelp encrusted with this introduced bryozoan are more susceptible to breakage during storms. 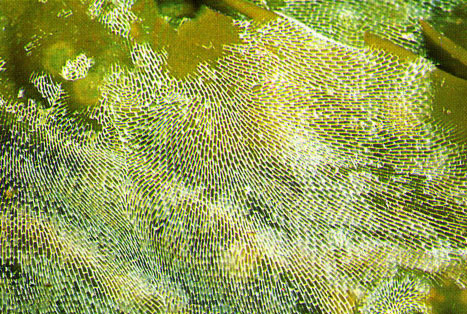 As a result the lacy-crust bryozoan has apparently contributed to the defoliation of the kelp beds in this region. The reduction in the kelp beds resulted in a dramatic decline of the sea urchin. The lacy-crust bryozoan has also been found to competitively exclude the native encrusting animals in New England for suitable substrate.